The first part of our John Calvin discussion can be found in our July post from the Reformation – 500th anniversary series. Guillaume Farel (1489-1565) invited John Calvin to Geneva in 1536. The church sorely needed guidance and leadership. 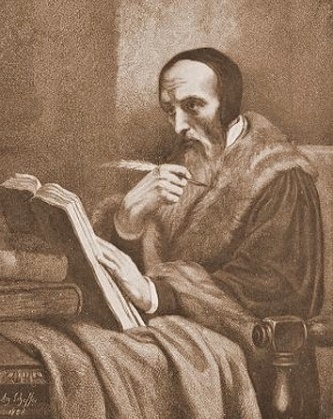 Calvin was first described in Geneva civil records as a “lecturer in holy Scripture.” Early in 1537 his articles composed to govern the church of Geneva were presented. Included in the articles was direction concerning the practice of the Lord’s supper and the associated use of excommunication. Other articles included the importance of instructing children, the need for elders, the importance of singing Psalms, and a twenty-one-article confession of faith which all who joined the church had to affirm. Calvin, Farel, and other pastors believed that one could not take the Lord’s Supper without affirming the confession of faith, but the Geneva government, as represented in its council, disagreed and said all should be able to partake regardless. This tension between the state and the church led to ordering Calvin and Farel to leave Geneva in April 1538. The history of the church is often a history of the confusion of church and state and the council’s ejection of ministers is an example of such a conflict. When the state and church come into conflict, the state inevitably wields its sword against the church.